Home » When is an ex-bat not an ex-bat? The introduction of the battery cage ban in January 2012 was widely publicised and heralded as an end to hens in cages throughout Europe. But it also created a misconception that has continued with the widely held view that ALL laying hens in the UK are now either free range or barn birds. Another little known fact is that all commercial laying hens are sent to slaughter at around 78 weeks of age when their working life draws to a close… unless they are amongst the few lucky enough to find themselves in crates bound for the BHWT rather than on a haulier’s lorry bound for the processing plant. The higher welfare cages that replaced the barren battery system are referred to as colony or enriched cages. As most of you will know, the system allows hens greater space to move within a large cage that typically holds around 80 hens. Scratch mats and perches are provided as are small nesting areas. Colony egg producers have invested heavily in the industry and tend to be large units with strict bio security and very limited public access. We have, however, successfully forged links with a number of these farms, and we always give priority to hens from colony cages. In fact over 92% of the hens we find homes for come from the caged sector. Very occasionally we take barn hens (because they too, don’t get to see the big outdoors during their lifetime) and intermittently we will take a small flock of free range hens. We take free range birds usually because there are no colony or barn hens available at the time. However, you have made it repeatedly clear that you prefer our colony hens as it gives you a sense of satisfaction to know your adopted hens will enjoy freedoms other hens take for granted. On the odd occasion that you are invited to adopt free range hens, many of you elect to wait for the true ex-bats, so you can enjoy watching them flourish and get to grips with all the elements that the natural environment offers. And we all know that seeing a hen sunbathe for the first time is magical, there’s no doubt about that. There’s a strong feel-good factor that comes with adopting hens that have lived their lives in a caged environment knowing their working days are over. This is why we want to advise supporters that not all hens being offered for adoption by some other organisations, are the beloved ex-bats you think. In short, some free range hens are being passed off as caged. OK, so if their lives are still being saved why does this concern us you might ask? 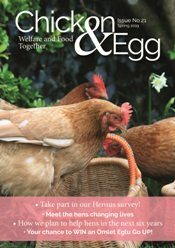 From your comments we know how helping caged hens is vitally important to you, and we think it’s unfair to misinform the people kind enough to adopt ex-commercial hens. The BHWT will always advise which system the birds you are adopting have come from. On the rare occasion we have free range hens, we ensure they are only offered to those able to provide adequate space. It’s often difficult to tell the difference between a free range hen and a colony caged hen at the end of her laying life. We used to regard feather coverage as a reasonable indicator of the life she once led, but that has proven to be another misconception. Feather coverage is more often down to the quality of husbandry, and health of the flock rather than the system they are raised in. We have seen very poorly feathered free range flocks and well feathered colony birds. One way to distinguish is to look at the combs; free range hens usually have vibrant scarlet red combs. Look at a colony hen and she will usually, although not always, have a paler comb. Look at the legs and feet; if they are very clean, and haven’t tramped through a bit of mud during their working life, there’s every chance they could be from colony cages. 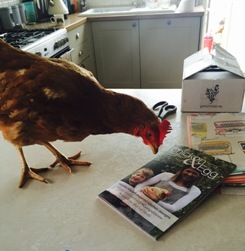 If you’re unsure of the system your hens have lived in, you must ask.